"Those with the most authority tend to tell more often than ask... We tend to offer thinly veiled advice through our questions instead of seeking to better understand another's perspective... Our questions are tools. Our questions have consequences. Really good questions have the potential to illuminate uncharted or rarely explored terrain... If you think you already know how the other person will respond, try to come up with a different question." This is the kind of book that's best absorbed slowly, taking the time between chapters to journal or discuss our responses to the poems, stories, and questions. Each chapter begins with an invitation to "Pause" by reading and reflecting on a poem or quotation. This is followed by a story to "Ponder," from the author's own experience or another person’s life. The third part of each chapter is "Practice," a deceptively simple action to integrate the theme into our day. For example, the first chapter begins with St. Francis de Sales' advice to "Be who you are and be that well." This is followed by the story of Henry David Thoreau’s struggle to find his voice as a writer. Finally, we are asked to "do one small activity that you enjoy doing and you do well." A later chapter begins with a quote from Ann Patchett about learning "to see school as something that goes on everywhere, all the time, not just in libraries but in parking lots, in airports, in trees." Millis follows this with an anecdote about an elderly man at her local park who delighted in teaching passersby how to create giant bubbles. The chapter ends with the suggestion to "reflect upon everyone you met today, both planned and unplanned, and call to mind one person in particular from whom you learned something unexpected." 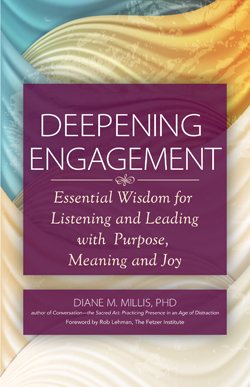 Deepening Engagement is for anyone who wants to take the time to reflect on and discuss the deeper questions of our lives, our relationships, and our society. "What most differentiates deeply engaged leaders… is their overriding concern for their way of being in the world rather than the position they hold or the roles they occupy… Regardless of who we are or what we do for a living, each of us has opportunities to listen, lead, and contribute to shaping a better future." You can read an excerpt at collegevilleinstitute.org, about what it means to be deeply engaged, and how this is demonstrated by a pastry chef from Burkina Faso whose relationships with his employees matter as much as the desserts they produce.